A mass of men in identical outfits and red masks enter a subway in Stockholm. A woman surveys the group and after closing her eyes, she follows. A group of the men board a train quickly followed by the woman. The train departs. The red-masked men notice the woman as she watches them. She closes her eyes and smashes a nearby panel. Unseen violence ensues. By the time the train arrives at the next station, the men are all unconscious save for one. His hand is severed, and the brief case attached is gone. And so is woman. HIt the jump to continue reading but expect some spoilers. Coulson takes Skye and Agent May to investigate the robbery on the train. Skye hypothesizes ESP which Melinda shoots down due to lack of evidence for psychics even existing. Before long, Skye begins to offer a method to find the identity of the thief: Instagram. Hundreds of photos on Facebook, Instagram, and Twitter give SHIELD the ability to find an image of the thief. Coulson recognizes the woman instantly: Akela Amador, a former trainee of Coulson. Agent Ward is able to use facial recognition to track Amador to a small town in Belarus. In a hotel, Amador makes the trade with her buyer. She receives a keycard. While Coulson and Ward search the town, Skye and FitzSimmons search wireless communications for any other sign of Amador. Coulson and Ward find a woman who recognizes Amador. She praises Amador as her angel who warned her to see a doctor. As it would turn out, the woman had a tumor. The woman also claims that Amador would know Coulson was coming with her gift. Cut to Skye cracking a video feed. The video feed travels down a road to a van. The van that Skye and FitzSimmons are currently sitting in. Amador rams the truck off the road. The team returns to the Bus. May and Ward do not trust Amador, but Coulson wants to give her the benefit of the doubt. Skye is able to reconnect the video feed from before. The team discovers that the camera is in Amador’s eye. A cybernetic enhancement which can also see in X-ray when Amador closes her eyes. Coulson realizes they can discover Amador’s location by monitoring the feed. May volunteers for the first shift. After a vote of confidence from Skye, Coulson discovers May has discovered Amador’s location and left. May confronts Amador, but it’s Coulson who comes to the rescue. Amador is brought back to the Bus. Skye is able to hijack the feed with Ward wearing a pair of glasses capable of simulating Amador’s eye feed. 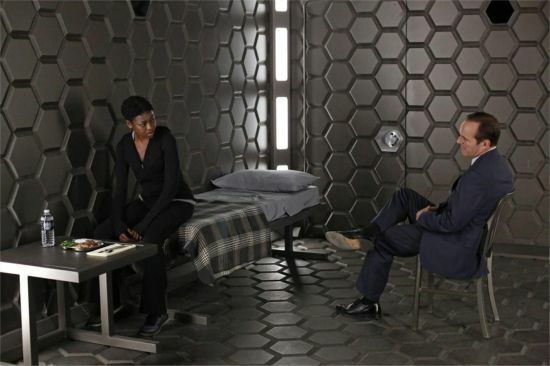 Coulson discovers Amador’s history including her capture and the fail-safe implanted in her. Amador also reveals some details of her handler: the Englishman. So now Fitz and Simmons are tasked with disabling the fail-safe, while Coulson is on the ground hunting for Amador’s handler with May’s guidance. SHIELD Team Go! Ward makes it through the target building without any resistance, but he has some trouble with the order to seduce the final guard. He attempts to chat up the guard, but when it doesn’t work, he simply knocks the guard out. He busts into the next room to discover two men working on typewriters and chalkboards filled with what appear to be scientific equations. Ward discovers a section that looks alien in nature. Mission complete. The messages to Ward allows Coulson to narrow in on the handler. Ward discovers that he needed the previous guard to punch in a password. He begins his escape. Fitz and Simmons have removed the cybernetic eye, but Fitz does not know how to disengage the kill-switch. He checks with Ward, but Ward catches a glimpse of himself. Ward tells Fitz to cut the wires, which he does just as the fail-safe explodes in a container. Coulson finds the handler, but upon revealing himself as SHIELD, the Englishman’s fail-safe pops. Amador’s handler was a former MI6 agent who’d gone off the grid previously as well. The big bad is still out there, but Amador is safe. Coulson promises he will testify to help in any way he can. As May escorts Amador into SHIELD custody, Amador questions what’s been done to Coulson. Melinda is unaware, so Amador drops it. The after credits scene is just a joke scene using the x-ray specs from earlier. I’m interested in this secret threat that is being hinted at, but is it the same as Rising Tide? Or are the big bads the same as the ones behind Project Centipede? Also Amador’s knowledge of what’s happened to Coulson seems to imply LMD. With her cybernetic eye, she’d be able to see all the tech under Coulson’s human looking skin. And maybe an LMD in the MCU isn’t as all-out robot as the Marvel proper LMDs.